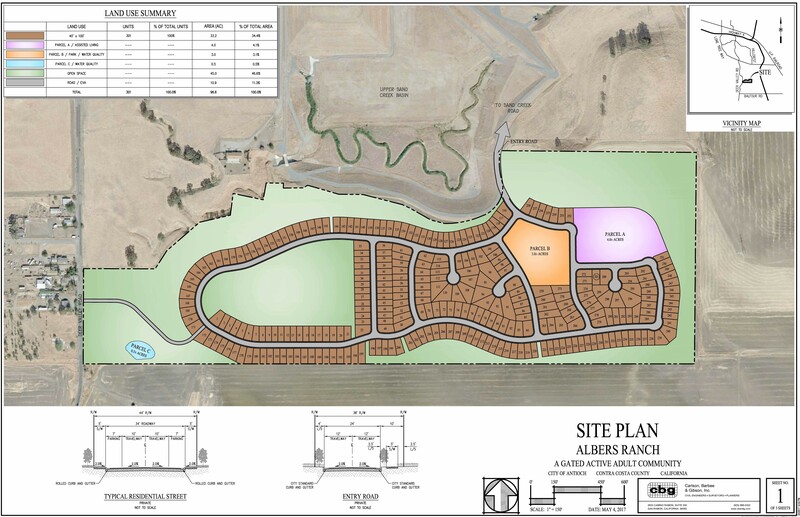 The Antioch City Council at their meeting on Tuesday, January 9, 2018, heard the preliminary development plans for the Albers Ranch Project, a proposed gated, senior community in the Sand Creek Focus Area. It is planned for land south of Kaiser hospital and the actual Sand Creek, on the east side of Deer Valley Road. According to the staff report, “The preliminary development plan consists of 301 residential units, a 4.0-acre assisted living facility, a 3.0-acre park and water quality facility, a 0.5-acre water quality facility, 45.0 acres of open space, and 10.9 acres of roadways. The entire project would be senior housing and would be gated with private amenities. Community Development Director challenged the proposals in the project as being inconsistent with the city’s General Plan, but Mayor Sean Wright later said that was expected. Wright opened the public hearing, and former Antioch City Manager Mike Ramsey, the representative of the applicant Lucia Albers, had 10 minutes to offer their perspective on the project. He argued in favor of greater hillside grading than the city currently allows. The grading will allow for view lots and will require a General Plan Amendment. “There’s not enough of a difference in grading between the current hill and the plan,” Ramsey said. He also mentioned that “the school district will enjoy the fees they collect without any impact on the schools,” from the seniors who will be residents of the new community. No one spoke in opposition to the project. Lucia Albers spoke next, stating there are a number of developers interested in the project and want to begin building, now. She said the grading was “in order to elevate the pads and meet the sewer” requirements. Albers mentioned the senior assisted living facility, saying “this will be a beautiful project. It is going to be something that will compare to any senior housing development” in other cities. “It will provide security because of the seclusion of the area,” she concluded. “We would like reconsideration to smaller lot sizes, as seniors don’t want a lot of yard maintenance,” he said. He also asked for reconsideration on the senior assisted living facility, stating “there are seniors on waiting lists for assisted living facilities” in the area. The council then took up the matter, asking staff and Ramsey questions about the project. He mentioned that staff is recommending a minimum of 5,000 square foot lots while the project proposes 4,000 square foot minimum lots. Tiscareno asked Ramsey to provide examples of other senior communities that had the smaller lot sizes. He then asked staff about the assisted living facility proposed in the plan. Mayor Pro Tem Lamar Thorpe spoke about the two projects in the Sand Creek area that had previously been approved and weren’t in compliance with the General Plan. He also said that the Aviano project was zoned for senior housing, and was approved as single-family housing. “So, there’s no consistency in the General Plan or the projects approved,” Thorpe stated. He then spoke in favor of the Albers Ranch project, saying “I think senior housing is one of” the desires of the council. Wilson spoke briefly about her concerns with the proposed hillside development in the project. “If we can make that work within the perameters, then I think this is a very good project,” she said. Ogorchock then offered her supportive comments. “I too have an issue with the hillside ordinance. It is difficult to see our hills going bye-bye,” she stated. “The 4,000 square feet homes, seniors don’t really want anything bigger,” Ogorchock concluded. Wright then gave his perspective on the project. “I think the request you have heard from council, today is to make General Plan Amendments to bring the projects forward,” Wright said directing his comments to staff. Please work with the applicant closer to something we can work with. But, we have a long time before this applicant can come to us for an up or down vote. The hillside ordinance was a lot of mixed emotion by the last council. It wasn’t unanimous. But, Wright pointed out that the item was only on the agenda for discussion and for the council to give to staff. In other council action, a solar panel energy project to provide power for the Lone Tree Golf & Event Center was approved by the council. It will cover one of the parking lots. It’s expected to provide a cost saving for the course and city. They voted unanimously to pursue eminent domain proceedings for the acquisition of private property to extend the eastern end of Prewett Ranch Road to Heidorn Ranch Road. The developer and property owner couldn’t agree on a purchase price. No one spoke in favor or opposition to the item. “We still have a number of steps before we’re running off to court,” he added. City for providing art and cultural programs and managing the Lynn House, effective December 31, 2017. The Arts and Cultural Foundation of Antioch has been providing citywide programs and services, and managing the Lynn House, for twelve years. Thorpe mentioned how he feels that only certain groups receive funding from the city. Wilson said she would like to see it be a grant process with groups submitting proposals. Wright chimed in saying he planned to discuss the matter during the council retreat, this spring. This entry was posted on Tuesday, January 9th, 2018 at 10:57 pm and is filed under News, Arts & Entertainment, Growth & Development, Seniors. You can follow any responses to this entry through the RSS 2.0 feed. You can leave a response, or trackback from your own site.